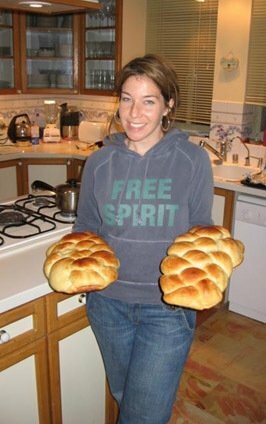 Here’s a delicious challah recipe! Hanukkah is approaching us: Friday night! Here is a great challah recipe for all your celebrations. Mix dry ingredients in a large bowl. Create a “well” in the middle of the dry ingredients to pour wet ingredients into. Mix wet ingredients together with blender and pour into the bowl with the dry ingredients. Lightly coat a bowl with olive oil. Place dough in the bowl. Flip the dough over in the bowl to ensure the entire ball of dough is lightly covered in olive oil. Cover the bowl with a tea towel and let the dough rise. Dough should double in size. (find a nice warm place out of harms way.) Don’t touch while the dough is rising. After bread has doubled in size, punch down the dough and let rise again. This should be approximately 20 – 30 minutes. Take dough out and cut into two even pieces with a knife (do not tear apart). Cut each individual piece into to four separate pieces and roll into long round pieces (i.e. like a pipe). Braid the four pieces together. Over-under-over – under. Place each challah on a baking pan and lightly coat the challah with an egg wash (mix one egg with water) and add sesame seed if you like. Let the challah rise until nice and big and beautiful. Place in the oven. Bake at 350 degrees for 25-35 minutes or until golden brown on top. Feel free to take the bread out and check if it is done by turning it over (gently) and seeing if it’s still doughy underneath. Enjoy your challah! It’s best served hot with butter. ← Still, I Believe That.